Let us introduce you to the Large Munsterlander. The Large Munsterlander's origin is in and around the area of Münster, Westphalia Germany. They were first brought to the United States in 1966 by Kurt von Kleist. It is a versatile hunter. 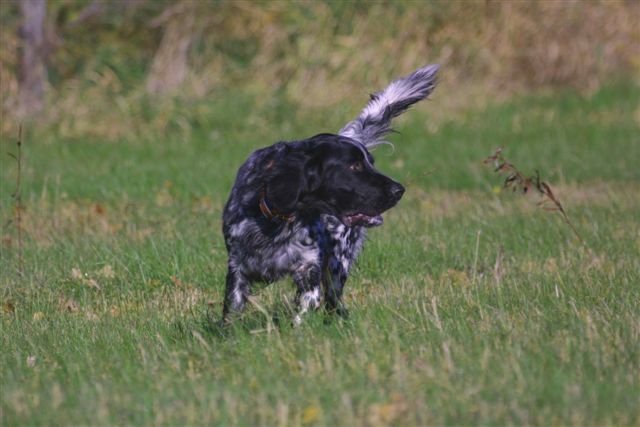 The Large Munsterlanders are bred for their biddability, point, retrieving and tracking abilities both on feather and fur. They are a medium to close working dog in the field. Black and white in color with a variation in looks. Weighing between 50-75lbs. Standing in height from 58cm. to 67cm. Make no mistake, this is a die hard hunter no matter what the weather or terrain. Pups are only placed in avid hunting homes.